New York is a point behind Washington after defeating the Flyers, 4-2. 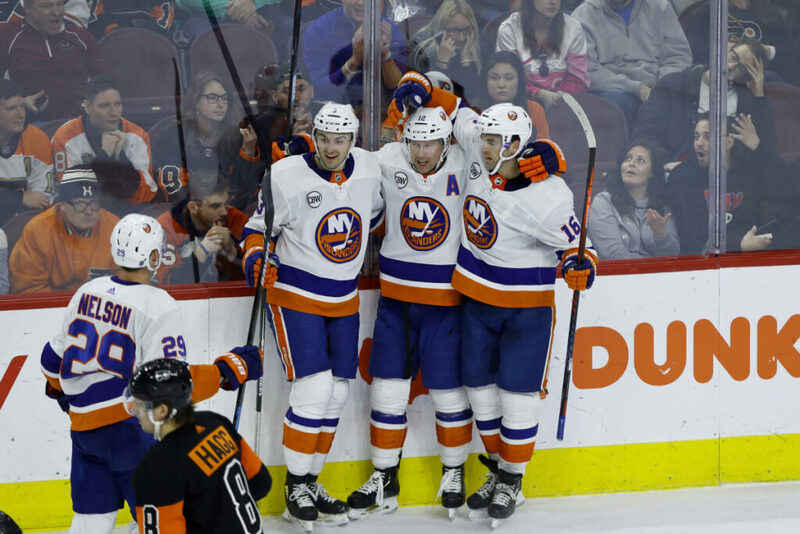 PHILADELPHIA — Josh Bailey scored twice Saturday, stopping a 12-game drought, and the New York Islanders beat the Philadelphia Flyers, 4-2. Nick Leddy and Brock Nelson also scored for New York, which had dropped two straight and 3 of 4 overall. Robin Lehner made 22 stops. The Islanders (43-25-7) moved within a point of idle Washington for first place in the Metropolitan Division. The Flyers (36-31-8) had won 2 of 3, including a 3-1 victory at Chicago on Thursday night. But the home loss against New York is a big blow to their fleeting chances of rallying to the second wild card in the Eastern Conference. AVALANCHE 4, BLACKHAWKS 2: Colin Wilson scored his first goal in more than a month, Philipp Grubauer stopped 29 shots and Colorado held on at Denver to earn its fourth straight win. J.T. Compher and Sven Andrighetto also scored. Derick Brassard added an empty-netter for an Avalanche team in the thick of the Western Conference wild-card hunt with seven games remaining. SENATORS 4, OILERS 3: Brady Tkachuk scored his second goal of the game 2:09 into overtime as Ottawa won at Edmonton, Alberta. Alex Chiasson, Connor McDavid and Colby Cave scored for the Oilers (33-34-8), who have lost 3 of 4. Edmonton stands six points out of the last wild card spot in the Western Conference. DEVILS 2, COYOTES 1: Blake Coleman and Pavel Zacha scored in the fifth and sixth rounds of the shootout, and New Jersey won at Newark, New Jersey, to hurt Arizona’s playoff chances, sending the Coyotes to their fourth straight loss. Drew Stafford scored in regulation for New Jersey, and MacKenzie Blackwood made 23 saves in regulation, and stopped 5 of 6 chances in the shootout. Oliver Ekman-Larsson scored for Arizona and Darcy Kuemper had 31 saves. HURRICANES 5, WILD 1: Teuvo Teravainen had a goal and two assists, and Carolina kept pace in the playoff race with a win at Raleigh, North Carolina. JETS 5, PREDATORS 0: Kyle Connor had his first NHL hat trick and added an assist as Winnipeg won at home to clinch a playoff spot. CANADIENS 7, SABRES 4: Brendan Gallagher had two goals and an assist, and Montreal won at home for its third straight victory.